On the home page, click on the "Sign In" button in the upper right corner. When you reach the "Sign In" page, click on "Forgot your password?". 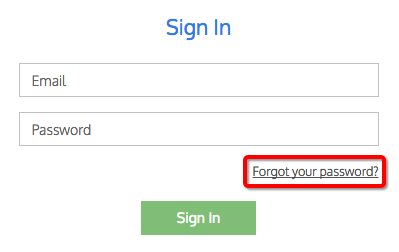 When you reach the "Forgot Password" page, you will be prompted to enter your email and click "Send". You will receive an email shortly after you complete this form with instructions on how to reset your password. When signed in, click on the "Account" button in the top right corner. A drop down menu will appear. Click on "My Account". When you arrive at the "My Account" page, click on "Change Password". You will then be prompted to enter a new password. Once you click submit, your password has been changed!